Interestingly, but coincidentally, I had previously talked about the paths that some rich nations (measured by GDP per capita) had taken. One of them was the financial services approach. My observation was that this seems to work only in relatively small countries (smaller than New Zealand) and that it generally means making the kind of compromises that I don't believe New Zealand would make. Now, John Key has made the switch from national cycleways to financial services with the same level of consideration as the cycleway choice - ie not much. Financial services do not appear as primary industry for any country of any size that is rich, including Ireland (which is supposedly the model for Key's ideas). Being wealthy is about adding value not hanging on coat tails and that is what financial services is. Very small countries can do very well by hanging on coat tails but there is one of two prerequisites for this. You either, first, have to be a country hanging on the coat tails of much larger neighbours (and I mean much larger - such as Liechtenstein to Switzerland and Austria and the rest of Europe); or second, you have to be willing to, perhaps not quite turn a blind eye, but certainly be very poor of sight. You either represent a neutral and acceptable option to powerful neighbours (by virtue of not being a threat, somewhat dependent on the neighbours and culturally similar); or you don't ask questions about where all that money came from and you certainly tell no tales (ie you struggle to recollect any details of that particular transaction). Let's be clear, despite a national small man syndrome New Zealand does not fit the first category and I don't for a minute believe that we want to be in the second. Hear is the fundamental problem with expecting financial services to lead to financial wealth. Capital is an enabler. Capital enables someone else to substitute for resources or labour or both. If you are specialising in financial services then the truism is that you are enabling someone who isn't you. Unless a country's wealth needs are at the margin of large neighbours wealth generation then enabling someone else will not generate sufficient wealth for a country to be wealthy. Despite the self-promoted importance of the financial community all money is dumb money. Money is basically a wildcard for resources or low skilled labour. If you don't have low skilled labour or resources then money can substitute, but it is no more wealth generating than iron ore. Wealth comes only from high skilled labour. The kind of skill that can't be substituted for by capital no matter how much you can throw around. The kind of labour that doesn't make things but designs the things that others then make. The high skill atracts plenty of money which then pays for plenty of relatively cheap resource and cheap labour. Rich countries make some things, they can afford to pay their lower skilled populace lots of money (after all why not keep it in the country when you can) but what they do - fundamentally - is design the electronics, the ultra-lightweight ultra-strong materials, the robots that make robots, the processors that make processors, etc. Assuming that New Zealanders are willing to hang up their morals then financial services might produce enough wealth to fund a population of, say, the Cayman Islands (about 49,000). That's enough to cater for two years of New Zealand's population growth - max! We could achieve the same economic outcome, in per capita terms, by restricting immigration for two years. One of the reasons that I started looking at the New Zealand economy was due to an inspirational presentation by Dr Paul Callaghan. Dr Callaghan wants New Zealand to return to the top of the OECD wealth rankings through embracing high technology entrepreneurism. "Let's do the business case" he said; and knowing a bit about business cases, strategy and such things I thought I would have a go. Unfortunately I haven't helped Dr Callaghan much. So far I haven't been able to establish a strategic advantage that stands out that New Zealand could leverage internationally. Those countries that established high technology economies did so because the timing was right and they took their opportunities. Most did it because they had a history of it, some were already wealthy and sought to diversify at the right time and some were opportunists. New Zealand is probably 30 years (maybe even 40 years) late in its attempt to go high technology (except in agriculture which we already do). Still, as I feel I have let Dr Calaghan down I have asked myself the question "Why wouldn't the next Google grow in New Zealand?" Everyone wants a Google. Google is high technology, it is very 'weightless' and it is enormously successful. In theory a Google could happen anywhere but Googles don't happen everywhere they (if we include Microsoft, Apple and the plethora of Electronic Arts, Facebooks, MySpaces, etc) they happen in one place - the west coast of the United States (technically Facebook started on the east coast but is now based on the west coast). So how did Google start? It all started as a research project at Stanford University for Larry Page, who was joined by Sergey Brin. They explored a different method for prioritising web searches, successfully. Then they put the software into online production, founded the website and the company, raised $1.1million dollars, identified the profit making business model and exploded into massive success. Pretty easy really - although obviously it isn't. Professor Jim Collins of Harvard published his key principles of building a great business and Page and Brin followed it exceptionally well. They were really good at what they were doing. They were passionate about it and started the business and raised the capital and then they worked out how to make money from it. Google also ticks the strategic marketing boxes - create a demand no-one knew they wanted, mass-customise it for both demand and supply, suppliers flock to you, clip the ticket. Think how successful this is by also considering Sony's Playstation and Apple's Ipod (or Iphone). Create something people want, make it accessible to both customers and alternative suppliers with as much flexibility and capability as you can. Clip the ticket. Page and Brin went one better. They tapped into the enormous content of the internet and made it freely available. Free supply and free demand means huge use. Work out that the same technology that makes the search engine so successful will also be perfect for automatically matching advertisers to people searching for their stuff and there you have a new economic empire. But how did two students manage to suddenly become software corporate superstars (in a story not too different from Microsoft by the way)? Well, let's not underestimate Stanford whose alumni are also responsible for Nike, Hewlett-Packard, Electronic Arts, Sun Microsystems, Nvidia, Yahoo!, Cisco Systems and Silicon Graphics. Is it an accident that Silicon Valley grew up around Stanford? How about the environment? I can't remember the article but I remember reading about the environment of places like Seattle and Palo Alto. The young people are published and known to the industry and the cafes, shops and general environs are full of the top guns. These are safe and pleasant environments where everyone mixes. People meet, deals are done and ideas flourish. In what environment in New Zealand would two students meet the founder of Sun Microsystems (or equivalent) who would then decide that he liked their ideas and hand over a check for US$100,000? Interestingly it wasn't Google who worked out (technically) how to make money from advertising, it was a crowd called Overture (originally Goto.com) who were bought by Yahoo! A legal battle ensued between the two competitors and resulted in a deal that I just don't think could ever be done in New Zealand. Google got the final piece in their business model puzzle and Yahoo! got a share of the Google action. I feel confident that such a battle in New Zealand would have gone on (bitterly) for ever in the courts to the detriment of both parties. Some might argue that Google got the better of the deal but Yahoo! got a share of that success and went on to find their own niche. Then Google went on to the second stage of its success story. Stay true to the business model (free service to internet demand and clip the ticket on advertising and supply) but be prepared to buy the new ideas (such as Google Earth). So why wouldn't it happen in New Zealand? What would we need? A couple of brilliant PhD students with a good idea, a world leading University, an almost cultural attitude to entrepreneurism (a desire to be good at something, to be passionate about it and how to make money), an environment of good ideas, collaboration and some spare money, an attitude of getting the deal done and getting on with it and lots more available good ideas. And what does New Zealand have? Apparently we have the students. New Zealand ranks well in the world for education quality (although we also manage to have quite high levels of illiteracy - ie we're good and bad). Supposedly we have the good ideas but we are under represented in patents, which suggests that we either don't have the good ideas or we don't follow through. We don't have the world leading universities. We have universities that are dedicated to fractious infighting under a funding system that makes them scrap for morsels. We have universities expending enormous effort in explaining why they should get public money rather than demonstrating that they should get public money. We have universities almost completely divorced from business (although this is as much business fault as the universities); and when they do collaborate it is again to fight for the public purse. We have universities rooted, for all practical purposes, in medieval fuedalism. Only the heriditary lordships are gone, instead the lordly posts are given out on time served without being difficult. Dr Callaghan suggests that a major problem with entrepreneurism in New Zealand is cultural; and I agree. New Zealanders like to be good at things (to an extent) but one should never ever be proud and passion is for those foreign types. Part of New Zealand is almost calivinist in its attitude. Only those who suffer in their work are morally worthy. No wonder the young people of New Zealand want to go overseas to experience life while they are young. New Zealand may be a great place to live but it is a crap place to work. Academically gifted New Zealanders who manage to escape the medieval fiefdoms become destined to either give in to the technocratic bureaucracies of political Wellington or the technochratic bureaucracies of corporate Auckland; or go overseas. In the absence of a passion of purpose then the need to make money becomes devoted to the passion of consumption. In terms of the rest of the environmental piece, the good ideas, the collaboration, the spare money and the positivist attitudes; well I think that this comes only when a country is rich. History suggests this strongly. The Renaissance was triggered by wealthy patrons who had the leisure time to take an interest themselves. The scientific discoveries of the Reformation and the Enlightenment were triggered by wealthy patrons (who often had the leisure to do the science themselves). The great thinkers of the enlightenment were either proteges of wealthy patrons or wealthy landowners themselves. The industrial revolution was triggered again by wealthy patrons (who again often did the science themselves). The great American universities, schools and museums were nearly all created by philanthropy during the United States great wealth boom. Entrepreneurism isn't, I think, the trigger of wealth; it is triggered by wealth. Perhaps the old adage "the rich get richer" is a truism. If New Zealand wants to get generally entrepreneurial then it needs to be generally richer. Dr Callaghan makes the point that New Zealand has its success stories. Weta Workshops is a great example. However, I think that Weta shows that the really strong plants can survive in all but the most dessicated of deserts. The point isn't that the desert can have life. The point is that a desert will only become a jungle if its whole climate changes. Unfortunately, I think scale is also important. Silicon Valley gestates so many good ideas because it has many well educated, connected, wealthy people. New Zealand could only achieve this kind of scale in a city the size of Auckland, but Auckland is spread out. Much of Auckland doesn't even consider itself one city. Can the next Google come from New Zealand? Yes, it could. It is, however, very unlikely. It is most likely to come from where it has come before. A jungle of growing entrepreneurism is most likely where there is already some wealth. Where there is both scale and intensity. Where there is passion and optimism. And, where there is excellence and pride in learning and knowing. It is worth listening to Dr Callaghan. If we do some things better then we should improve our technological development. However, this will only improve things, I fear, at the margin. To make a big difference in New Zealand's fortunes would need reforms far more fundamental. Ones we may not actually be willing to make; and certainly not the sophistry preached by our political elite. This post has taken me ages and I'm not sure it was worth it. It began because I was interested in understanding better how New Zealand's reducing relative wealth might manifest in a social sense. This lead me on a quest to better understand how wealth and the distribution of wealth affects a country. I'm not sure that I have reached any useful conclusions but it was an interesting voyage where I did at least learn a few things. Let me start by, once again, remarking on the availability of data. One would think that the governments of the world's free countries would be interested in making data about their country available. I can't comment on many countries but if New Zealand and Australia are anything to go by then most governments are far from the forefront of data presentation on the internet. One might expect that international organisations such as the United Nations might not only make data available but also provide good comparative data. However, it would seem that the United Nations is only interested in providing data once it has been 'correctly' interpreted by their experts. I had high hopes for the likes of WolframAlpha and my solid fall back the CIA World factbook. The problem for WolframAlpha is that the world's data is horribly fragmented and unless someone sorts it out properly it is unuseable. The CIA, it turns out, seems to be the most open, available, transparent and objective supplier of world data - who knew? Nevertheless, even the CIA can't publish data that isn't there, which comes back to the problem of countries not being very open about their own data. For example (according to the CIA World Factbook), 237 countries publish their population data, 227 publish their GDP, 205 publish their external debt, 107 publish their current account balance and 133 publish their GINI index (a measure of the evenness of income distribution). Anyway, I was interested in the perennial discussion of fairness vs wealth. 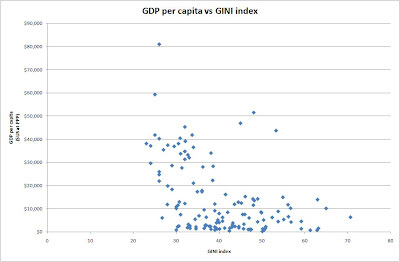 Therefore, I wanted to look at the GINI index vs GDP per capita. The GINI index is a measure of inequality. It determines how far away a country's income distribution is from perfectly equal (everyone earns the same). A GINI of zero means that every household has the same income and a GINI of 100 means that one household earns the country's entire income. Published world GINI numbers vary from 70.7 to 23, which is quite a spread. My hypothesis is that rich countries will tend to be more equal than poor countries. This was on the basis that prosperity spreads when people spend and a willingness to share comes from income surpluses. As the chart below shows there is a general relationship between individual wealth and the evenness of income distribution but it isn't as strong as I expected. It certainly seems that being rich is the best indication of being likely to have a more equal income distribution but there is a lot of variation. The interesting thing is that poor countries have pretty much a random outcome with respect to income distribution. It should be noted here, however, that many countries do not publish their GINI indexes. The tax havens are absent as are some of the most oil rich nations in the world. My second hypothesis was that the attitudes of a society are driven by its middle income earners. That is say that when a majority of people are well off then wealth spreads but if not then everybody, including the rich, tends to hoard. This is where finding data got very hard. The GINI index is relatively widely published and aggregated but this is about the limit of readily available income data. I probably could have searched through each country's data to find the morsels I was looking for but I would still be doing this well after Christmas and time is a scarce commodity. Therefore, I used what I had. GDP and population data provide an indication of the quantum of income and the GINI index tells us about shape. By doing some curve fitting I was able to come up with some interesting comparisons. These results are too inaccurate to publish any numbers but they did help lead to some logical conclusions. The first thing that became obvious is just how poor some countries are. Many people already know this but in making comparisons it became more real for me. For example, (based on financial wealth only) one would rather be poor in Malaysia than rich in Ethiopia (and the poor of Malaysia are pretty poor). Here it becomes obvious why the equality of income distribution is random in the very poorest countries, because here the evenness of income distribution is meaningless. Zimbabwe is a very unequal country (a GINI of 50.1) and Ethiopia is a surprisingly equal country (GINI of 30). However, Zimbabwe's inequality is a distribution between those that have practically nothing and those that have the merest pittance. Zimbabwe is poor even compared to Ethiopia. The distribution of wealth in Zimbabwe probably comes down to which village's goat survived the drought season. It is interesting to note the other extreme as well. Those countries that are very rich. A pertinent example is that one would rather (considering financial wealth only) be poor in Norway or Luxembourg than middle income in New Zealand. In fact, one would rather be poor in Luxembourg than middle income in the US, which is saying something. But richness is when the equality of income does matter. Here we look at the three outliers (of the countries that report GINI) Hong Kong, Singapore and the US. Here are rich countries that are also very inequal. Here there is evidence that wealth can offset inequality. Not so much Hong Kong but the poor of Singapore and the US are still much better off than most of the world. The poor of New Zealand may only be marginally better off than the poor of Singapore and are roughly equivalent with the poor of the US. But, the rich of Hong Kong, Singapore and the US make the rich of New Zealand seem pretty poor. The rich of these countries even match (and probably exceed in the case of Singapore and the US) the rich of Luxembourg. They are the uber-rich. One can only imagine the numbers that would come out of the tax havens (no wonder they don't report). Of the world's countries there are some which don't really have a poor. All countries will have a number of people who unfortunately or deliberately fall through the cracks. Nevertheless some countries have poor who generally aren't really poor. The line is obviously somewhat arbitrary but in my view these are countries who don't have a general poverty problem. There are the outliers, of course, Luxembourg (who is benefitting from centuries of careful diplomacy playing off its larger neighbours) and Norway (the most democratic and free of the oil rich nations) who really don't have a general poor. But I think you can add to these two Iceland, Sweden, Denmark, Austria, Belgium, Ireland, Germany, Netherlands, Slovenia, Finland, Australia, Canada and Switzerland. There are some close seconds but the numbers fall away quite quickly (there is quite a lot of difference even between Iceland and Switzerland). What do these countries have in common? They are relatively rich and relatively equal. They are all democracies and most of them are Western European. Two of them (the I-lands) have been hit very hard by the world recession but still feature high. They vary in their economic leaning from Sweden (quite left of centre) to Switzerland (quite right of centre). They do not have large populations, except for Germany which has almost three time Canada's (no. 2)population. One of them (Slovenia) has recently been freed to democracy and is tearing up the economic growth charts. Two of them are former British colonies that maintain a Westminster parliament system (New Zealand alone fails to represent in this group). It is inconclusive what makes these countries both fair and rich. Some on the left might argue that these countries are rich because they are fair. This doesn't seem right to me. Ethiopia is very fair but almost the whole population would rather be poor in the United States (or New Zealand). Kyrgyzstan is much wealthier than Ethiopia and is almost as fair but (based on financial wealth only) most of the population would still rather be poor in the US. Albania is much richer again than Kyrgyzstan, and is also fairer, but about half the population would be better off being poor in the US. The United States, Hong Kong and Singapre prove that wealth doesn't necessarily translate to equality of income but I think that it is still the right place to start. So, what of New Zealand? I think New Zealand properly belongs to the group which includes Japan and the United States. All three of these countries are countries that have been relatively richer than they are now. All three feel that things are slipping away from them. All of them show some degree of a middle income bracket that are tightening their belts and hardening their hearts. All three have poor who are just on the edge of comfortable subsistence and with many more people falling into poverty as time passes. All three are relatively high on the inequality stakes (especially the US). All three, I think, are going to experience significantly more social upheaval and distress as population increases and economic growth doesn't match the rest of the world. And which are the lucky countries? Norway is, perhaps, the clue. Luxembourg is a very special example but Norway is a real economy. Norway is a resource rich country with a relatively small population. The moral hazard with this post is that I have to firmly remind myself of the non financial benefits of living in New Zealand to avoid packing my bags and heading for Australia or Canada.